Silicon Optix, makers of HQV and HD HQV, provides an industry standard benchmark for looking at video quality by providing tests the cover all areas of video processing playback: (motion adaptive) de-interlacing, noise reduction, 3:2 Pull-down detection (Inverse telecine), Film Cadence and Film Resolution manipulation. The tests are scored out of 130 and 100 for the HQV and HD HQV tests respectively, where a score of 130 and 100 in each case is considered "perfect." We set the output at 1080p to test the video processing of the chipset, as opposed to the display. While we left the "performance settings" on auto, we did adjust the de-interlacing settings to find the best solution available from the drivers. 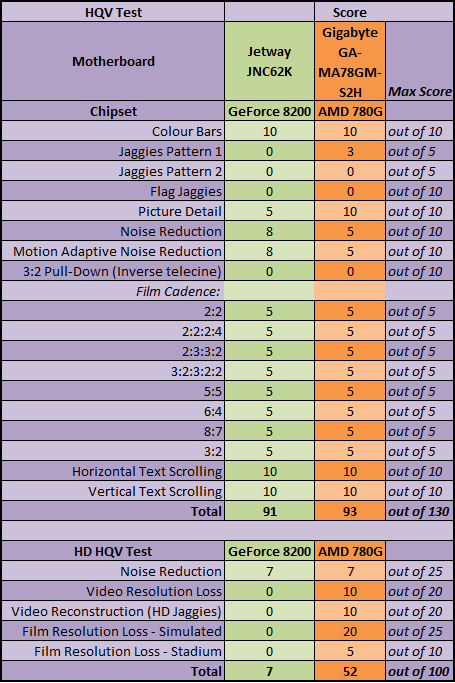 While the HQV score of the Jetway JNC62K with GeForce 8200 and nearly matches the very good score from the Gigabyte AMD 780G, it sort of tanks in HD HQV. While HD HQV concentrates on 1080i sources, so doesn't affect Blu-ray or HD DVD playback, it is still important for HDTV sources and general HD de-interlacing. While the actual scoring is entirely subjective, we do find the original HQV benchmark to be useful when testing a chipsets capabilities. The hardware deinterlacing with auto-detection was enabled in PowerDVD (7) Ultra, however the Jaggies in patterns 1 and 2 one and two were clearly visible still at almost every angle. In the Flag test, the jaggies were also still present but the quality of the image was generally quite sharp and very good. The picture detail test on the other hand was also good quality, matching the AMD 780G, but lacked the sharpness we've seen on the Intel G35 system. On the noise reduction and motion adaptive noise reduction tests, we used the Nvidia control panel to reduce the noise as there was no option in the PowerDVD software. Under the "application default" setting there is no noise reduction and it's clearly visible, and then by increasing the slider to 100 percent the noise reduction was absolutely perfect, however it also caused the image to shake noticeably slightly. Finally, despite enabling inverse telecine detection in the Nvidia control panel, no actual effect was observed in the video playback. The HD noise isn't too bad, like the Gigabyte 780G motherboard, but it is still clearly noticeable, however turning up the slider option in the Nvidia control panel causes the video to stutter badly - the GeForce 8200 is simply not powerful enough to reduce HD noise significantly. In the video resolution loss test with deinterlacing disabled there is no video resolution loss and the image looks perfect, however with hardware deinterlacing enabled the rotating bar the boxes now strobe badly - it's a partial result at best. Again, like HQV there is no real reduction in HD jaggies and in the film resolution loss tests the moire pattern is not apparent in the Stadium seats of the real film tests, however the boxes in the simulated tests flicker very badly. Could this mini-ITX GeForce 9300 Zotac board with integrated HDMI and WiFi possibly be the greatest home theatre board ever created? We drop in an inexpensive Intel E5200 CPU, bolt on a Blu-ray drive and check out this £120 mini marvel.